Gough was born in Watersfield, Sussex in 1886, the third and youngest son of David Baker and his wife Sarah (née Penfold). David was a gardener, born in East Woodhay, who moved around a lot working in Sussex, Berkshire and Hampshire before returning to the Newbury area by 1901, when the family were living at North Lodge, Beenham. Gough is found in the 1891 and 1901 census returns as ‘George’; this is probably an error of transcription (census enumerators copied the names of the householders’ forms in summary books – which are all that survive today). By 1911 Gough had completed his schooling and was working, according to their census return, as a game keeper – although ‘game keeper’s assistant’ may have been more accurate. However, he did not settle to a life on the land, instead he learnt the trade of bootmaking and set up a boot repair business in Newbury. The sole proprietor of a boot repairing shop in London-road, Gough Richard Baker, said he was the only one who could run his business, He was 31, and married. Conditional exemtion was granted. Conditional exemption was only a temporary reprieve; sadly the newspaper item does not indicate for how long Gough was granted - sometimes it would be a week or two in order to give a man time to settle his affairs before joining up, some times it would be for six months (the maximum), after which a further appeal might earn more time. All such decisions by the local tribunals could be appealed at the county tribunal, and many were - especially those which reprieved men from service. It is possible that Gough was only given a short reprieve, or that the military won an appeal against his exemption (the county tribunal was poorly reported in the criticial period). Either way Gough closed down his business and answered the summons to military service. On 19 August he joined the Royal Field Artillery and was sent to Aldershot for training. After basic training he was sent to No 7 Signal School to learn a specialist skill, vital to the artillery. During this training he was taken ill and admitted to the Military Isolation Hospital at Aldershot, where he died on 23 November 1916 of acute pneumonia. He was buried five days later at Shaw Cemetery in grave 2414. A large number of floral tokens of respect and esteem were sent by the following:- Mrs Baker (wife); Officers and Men of A Battery RFA Borden; Mr and Mrs H Baker (Reading); Edie, Ethel, and Alf; Annie and George; Eva and baby; Mrs A Baker, Mr Collins, A Parsons (Devizes); Mr and Mrs Rawlings; Gunner and Mrs Featherstone; Gunner and Mrs Dunnet; Mr and Mrs Green; Corpl and Mrs Hayward; Mrs Keel; Nurse Miller and family; Little Hilda; Miss Evelyn and Miss Elsie Allen; Miss Clark; Mr and Mrs and Miss Piper; Mr and Mrs Coventry; Mr and Mrs Bew and family; Mr and Mrs W H Kemp; Miss E Ford; Miss M Hurst; Mr and Mrs Smith; “Willie and Baby”; “An Old Pal”; Sapper and Mrs Harmer. The funeral arrangements were carried out by Messrs E Hart and Son of Northcroft, Newbury. Gough’s age appears to have been a problem: although he was only 30 when he died his gravestone and coffin plate both make him a year older. The announcement of his death in the Newbury Weekly News Births, Marriages & Deaths column also gives his age as 31, indicating that the family believed he was a year older than he was. His age was given accurately in the 1891 and 1901 censuses, but the 1911 return - completed by Gough himself - added a year to his age. Losing a son to sickness before he even left for the front was tragic, but worse was to come in 1918. 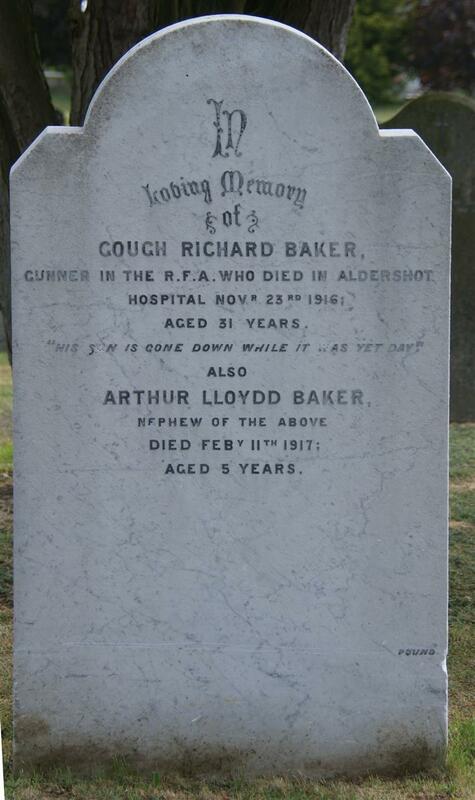 First Gough’s nephew, Arthur Lloyd Baker, died in Newbury, aged only 5 - he shares his uncle's grave. Presumably he and his mother, Sarah (née Claridge) were staying with his grandparents while his father was serving abroad. Then Arthur Lloyd's father and Gough's brother, Arthur James Baker (Pte 201585, 2/4th Battalion Hampshire Regiment), was killed in action on 10 April 1918, in Palestine and was buried in grave Q49, Ramleh War Cemetery. Then the third and final brother, John Henry Baker (Pte Oxfordshire & Buckinghamshire Light Infantry), died of wounds on 25 August 1918. He is buried in grave III.E.12 at Bac-du-Sud British Cemetery at Bailleval, France. Only Gough is remembered locally - on Panel 5 of the Newbury Town War Memorial and on the Speenhamland Shrine as well as on his grave in Shaw Cemetery. Neither of his brothers ever lived in Newbury and both were married and had settled elsewhere: Albert in Weston-super-Mare and John in Chalfont St Giles (where his name is recorded on the village war memorial). 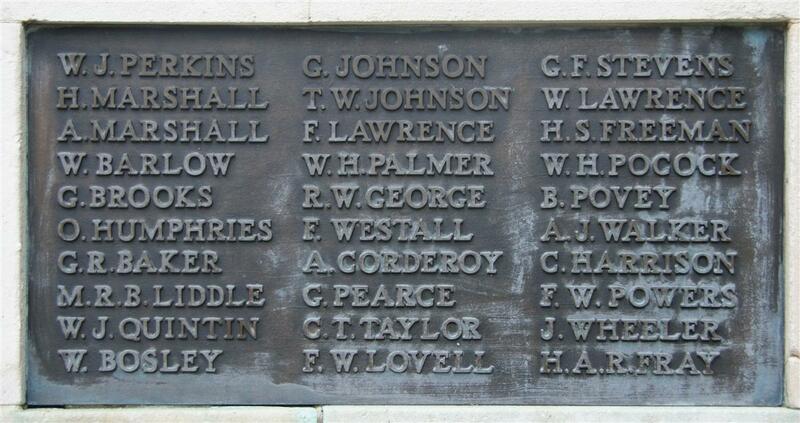 However, it is likely that their names would have been accepted for commemoration on the Newbury Town War Memorial had their parents put them forward. It seems that they did not do so; perhaps believing that only Newbury residents would be accepted.